Poignant Retirement Advice - Retirement Never! Giving funny retirement advice in your retirement speech can add interest and sparkle, but the content and your speech should reflect your personality. You should feel under no compulsion to use jokes, quotes or poems. They are not essential to an entertaining speech. Don’t try it if you are not confident of your ability to do it well. Imagine the look on his wifes face. And what does he have to look forward to? Happiness? Joy? Relief? The end of a working life! Perpetual unemployment! Deterioration! Stagnation! Decay! Luckily, most of you people - especially homemakers-dont have that problem. You never retire. But for all career men and women, my advice is: Avoid retirement as you would poison ivy in a nudist camp. By retirement I mean the sudden stoppage of work, going from the dynamic career to the doldrums, from vigor to vegetation. If you are seriously thinking about quitting your job, and have no ready replacement for it, permit me to offer you several practical suggestions: One, dont quit! Two, keep busy! And three, dont look back! Unfortunately, sometimes we do it ourselves, when we quit work prematurely. How often have you heard about men and women having heart attacks, shortly after retiring? Why? Because not infrequently, the retirement itself is more stressful than the work it was supposed to replace. My second point is a corollary to the first: keep busy! You've got to keep working, one way or another. You've got to have a goal in life in order to survive. There are a number of options available: employment, leisure, volunteerism...take your pick. If you choose employment, why not become a management consultant-like everyone else. All it takes is a title, a phone number and 500 business cards. If you need a title, be imaginative. I know an auto mechanic who is now a vehicle maintenance engineer. He repairs my Toyota - and drives a Mercedes. If you need a degree, thats simple for you Toastmasters. All you have to do is complete the Basic Communication and Leadership Manual, and put CTM (Competent Toastmaster) behind your name. For all anyone knows, CTM means Master of Computer Technology, and thats pretty important these days. Another way to keep busy is by what I call purposeful leisure. Too often people think of leisure as the absence of work. Nonsense! Its productive labour. Do you realise how much green fees and golf cart fees, for example, contribute to the gross national product? Billions! You golfers out there, men and women, tell your spouses that when you get up at four oclock in the morning. The best way to keep busy, of course, is by volunteer service. There must be a hundred thousand organisations out there that could use your help right now. They wont discriminate against you because of your grey hair-or the lack of it, you grey panthers and bald eagles. If you run out of ideas, try coordinating Speechcraft and Youth Leadership, the finest programs ever invented, for the training of the young - of all ages, and I might add, for the rejuvenation of jaded Toastmasters. Which brings me to my third point: dont look back! James M. Barrie, the author of Peter Pan, once wrote: God gave us memories, so that we could have roses in December. Roses, not regrets. Nursing homes are filled with people who cling to their regrets like security blankets. Pablo Casals at 90, for example, when asked why he practiced eight hours a day, replied: I think I'm improving. Just last week I heard of a Toastmaster who spent his first Social Security check on lessons in hang gliding. Thats the spirit! What it all adds up to is this: we cant quit. We cant retire from life. Its too precious. We've got to keep working, whether for money, fun or glory. And above all we mustn't look back. Funny Retirement Advice? Retirement Never! Its never too late to learn-to grow-to create, to do all the wonderful things we had no time for in our youth. This is what the last third of life is about. Its a time of discovery, when we really begin to see, perhaps for the first time, the providence of God, the love of family, friends and neighbours-even Toastmasters-and sometimes we even catch a glimpse of our own potential...still...to do great deeds. Life, my friends, is not a candle flickering in the breeze. Its a torch to light new flames. Roy was 77 at the time he gave this funny retirement advice. I have found his poignant and funny retirement advice to be a wonderful retirement gift to all who have read it since. I hope you enjoy it! This sample Retirement speech is reprinted here with the permission of Toastmaster International Magazine. 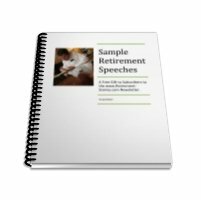 .... AND .... if you want to read more great Retirement Speeches, see our great free gift below!